WINNER will receive a Samsung UBD-M7500 - Streaming 4K Ultra HD Wired Blu-Ray Player or a comparable item, A Microsoft - Xbox One S 1TB Starter Bundle with 4K Ultra Blu-ray or a comparable item, Samsung - 55" Class - LED – NU7100 Series and more! 31 Daily Prize Winners will receive: Winner’s will receive 4 - 3 or 4 bag count cartons of JOLLY TIME Microwave Pop Corn each month for twelve (12) months. Daily winners will also receive fifty-two (52) Redbox® rental promotional codes. 1 Week 1 Prize WINNER will receive: A Samsung UBD-M7500 - Streaming 4K Ultra HD Wired Blu-Ray Player or a comparable item. Winner will also receive 4 - 3 or 4 bag count cartons of JOLLY TIME Microwave Pop Corn each month for twelve (12) months. Week 1 Winner will also receive fifty-two (52) Redbox® rental promotional codes. 1 Week 2 Prize WINNER will receive: A Microsoft - Xbox One S 1TB Starter Bundle with 4K Ultra Blu- rayTM or a comparable item. Winner will also receive 4 - 3 or 4 bag count cartons of JOLLY TIME Microwave Pop Corn each month for twelve (12) months. First shipment will arrive approximately November 15, 2018 and each month thereafter with last shipment in October 2019. Week 2 Winner will also receive fifty-two (52) Redbox® rental promotional codes. Week 3 Prize WINNER (1 total) will receive: A UHD TV with HDR or a comparable item. Winner will also receive 4 - 3 or 4 bag count cartons of JOLLY TIME Microwave Pop Corn each month for twelve (12) months. 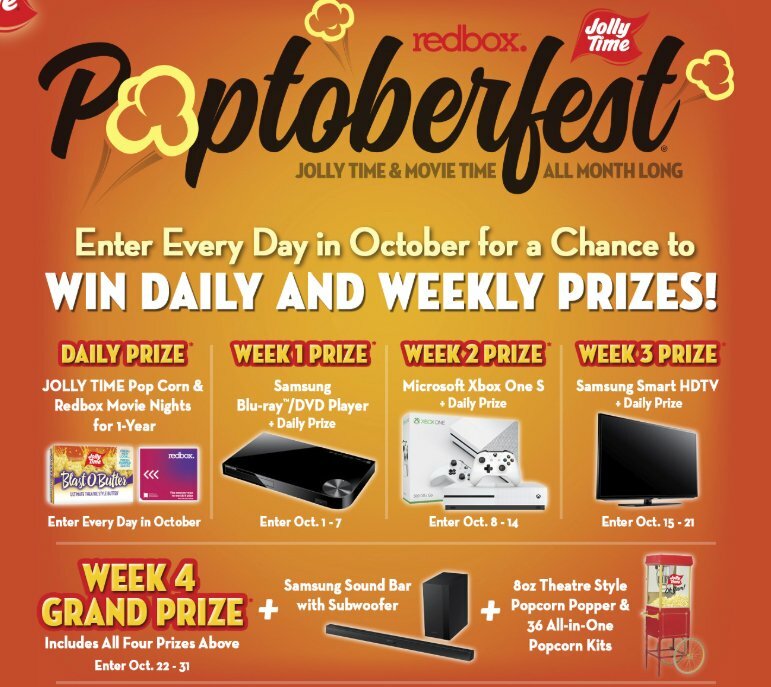 Week 3 Winner will also receive fifty-two (52) Redbox® rental promotional codes.